This week I sewed like a crazy woman and finished up two last minute Halloween costumes. 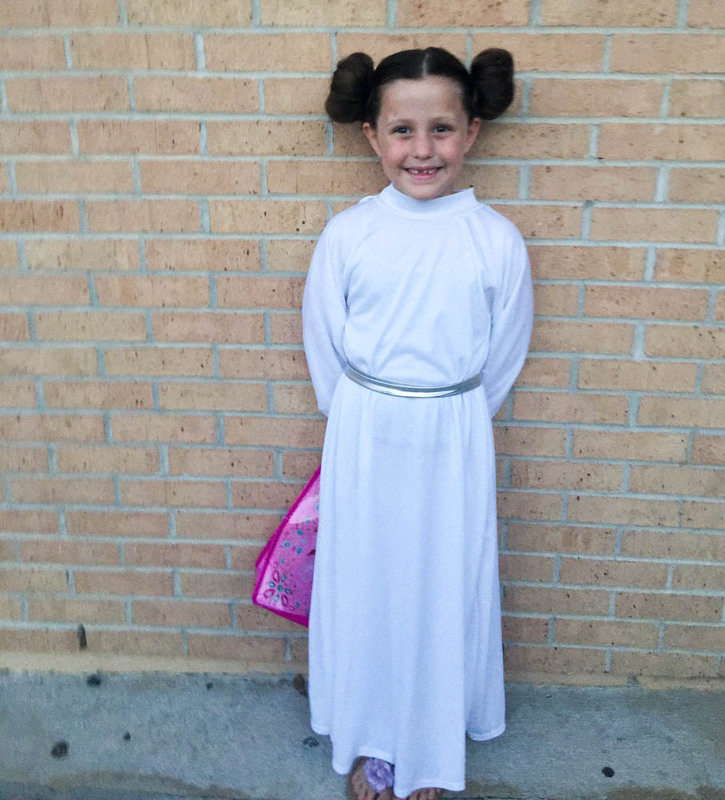 My 7 year old baby is a total star wars nut and wanted to be Princess Leia. She 'researched' her costume by turning on that oldest episode (the first Star Wars movie ever made) and taking notes on Leia's white dress. Lucky for me I came across this Space Princess pattern from SewCharmingbyBecky. I found the instructions to be so-so, but I knew how I wanted to sew it anyway. The pattern pieces were what I really wanted so I wouldn't have to spend the time drafting my own. And they were perfect. The only changes I made were to leave out the lining and to gather the ends of the sleeves to fit a 2'' cuff (a detail noted by my customer). By the way, we found great videos on YouTube for 'Sock Buns' and that's how we made that fabulous hair. This hood really made the dress a success... I wish I had a better picture of it. These are from our Trunk-or-Treat night. And what about the donut? I was the donut! How did this happen - the first Halloween costume that I ever sewed for myself? Well, I saw donut costumes at Target and I totally knew that I could do better. I came home and begged both my boys (and my husband) to let me sew them a donut costume. No takers. Then I offered to make a donut costume for my girls (in addition to the Cinderella and Leia costumes), but they turned me down also. I wanted so badly to make a donut costume that I went ahead and made it for myself. Read about Chloe's Cinderella costume and how to make the Ribbon & Tulle Skirt here. Anyway, I was so proud of my gingham flavored donut with sprinkles that I couldn't wait to show my kids. I wore it when I went to pick them up from school, lol. Don't worry. I didn't get out of the car. I thought it would be very funny, but then I thought it might ruin any chance I have of a relationship with my 7th grader. So I stayed in the car.